Durable 12 gauge steel shelves, 14 guage sides, 3/16" thick angle corners, and 12 guage caster mounts for long lasting use. One 12 gauge door with lockable handle with 2 keys. Bolt on casters, 2 swivel and 2 rigid, for easy replacement and superior cart tracking - see specifications chart. 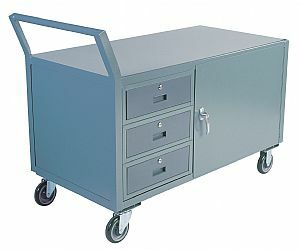 Clearence between shelves - 21"
Top shelf height - 31" (35" with full pneumatic casters).